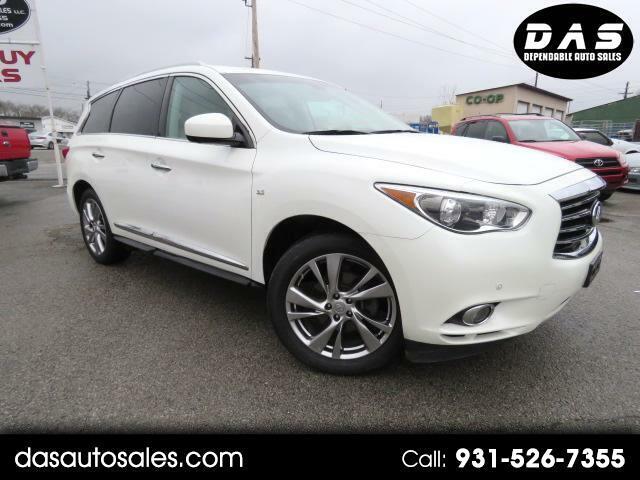 A superb choice for your transportation needs, our 2015 INFINITI QX60 AWD in Majestic White strikes the perfect balance of inspired performance, innovative technology, and absolute luxury! Powered by an award-winning 3.5 Liter V6 that offers 265hp connected to an innovative CVT for remarkable passing. This All Wheel Drive machine returns nearly 26mpg while accented by 18-inch wheels, automatic bi-xenon headlights, fog lights, and LED taillights. The cabin has been meticulously designed with upscale elements including rich wood, heated and cooled leather seats, a sunroof, and metal accents. Other amenities include tri-zone automatic climate control, Bluetooth phone connectivity, a central touchscreen display, rear entertainment, and a great sound system with satellite radio as well as an iPod/USB interface. Safety is a priority at INFINITI, which is why you'll find a multitude of advanced airbags, Vehicle Dynamic Control, an anti-lock braking system w/brake assist and a rearview monitor all standard. These features are working behind the scenes at all times; assuring you and your loved ones are out of harm's way. Our QX60 is everything you need in a luxurious crossover. Get behind the wheel to see for yourself! Print this page and call us Now... We Know You Will Enjoy Your Test Drive Towards Ownership!